FlightHelmet.com can custom paint or refurbish any flight helmet or helicopter helmet. Is your helmet showing its age? Send it to us and we'll repaint it! Since most helmets require dis-assembly to be painted, its also a great time to replace or update visors, liners, earcups, and electonics. We have all the parts neccessary to make your helmet new again. Please call or send us an email for more information and a price quote. 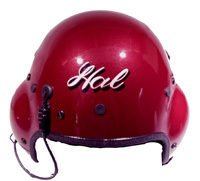 FlightHelmet.com can add helmet lettering, decals, squadron insignias, names, checkerboards and much more. Prices vary depending on request, so please call or send us an email.